I recently wrote this recipe as a paper for class at my MBA program. As I have learned over the past few months, time is of the essence as a First Year Student. We spend most of our time in class, preparing cases, attending briefings, getting ready for interviews, meeting with professors, participating in various clubs, and attending the occasional social event. For many of us, we struggle to find the few minutes where we can relax, turn on the TV, call friends and family, exercise, run errands and very importantly, eat. While I realize that some first years do not cook, do not like to cook, and do not want to learn how to cook, I think there are a fair number of students who would enjoy learning a few easy meals to make. Though eating out is probably in many cases the fastest, it is often not as tasty, satisfying or healthy as making a meal at home, and besides, eating all meals out can get very repetitive, and the cost of eating out is usually more expensive too. There are only so many places to grab a quick bite on a school night. As I was inventing this recipe, I was really trying to take the student lifestyle into account. Given our time constraints, I know we cannot be running to the grocery store very frequently, or be spending time searching around for an extensive and difficult to find set of ingredients. So, the list of ingredients needed to be short and simple. I also tried to take into account that the meal needed to be reasonably well -rounded in terms of the different food groups to give the student energy and nutrition. 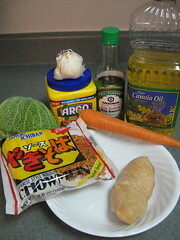 I tried to think about the shelf life and costs of the ingredients so that the student could have the ingredients around for a while should cooking plans not work out due to other unforeseen activities, and even then would not have to worry about the costs too much should there be spoilage. Finally, I made this a meal for one, knowing that many students live on their own. I hope you will find the following recipe user friendly and helpful. 1. Remove one chicken breast from the freezer. Slice immediately. 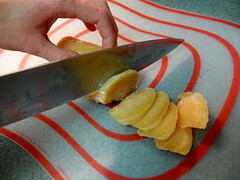 It is easier to slice meat from frozen. 3. 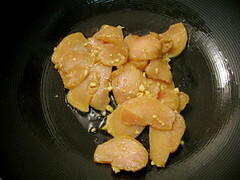 Combine the chicken, cornstarch, garlic and one tablespoon of the soy sauce. 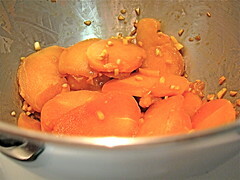 Stir together well and allow to sit and marinate while preparing other ingredients. Cornstarch helps to seal in the moisture of the chicken. 4. Peel the carrot. 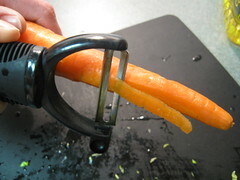 This can either be done with a vegetable peeler, or by using a sharp knife to scrape away the outside layer of skin on the carrot. 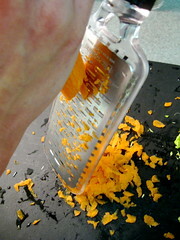 Using a grater, grate the entire carrot. Set aside in bowl. 5. Chiffonade the cabbage leaves. To do this, take one or two cabbage leaves, and roll them up. 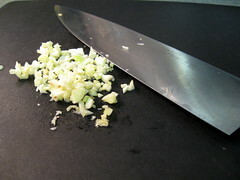 Then from one end, start running the knife through the leaves, cutting very close together. 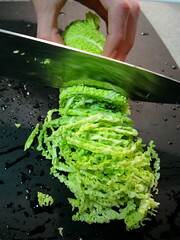 The end result will be very thinly sliced strips, and this is known as a chiffonade. Repeat until all the cabbage is in a chiffonade. 6. Now that the ingredients are prepped, it’s time to start cooking. 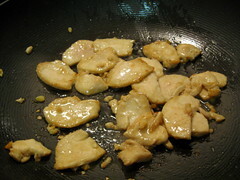 Place half of the canola oil into a wok, or other large pan, and allow it to heat up until very hot. 7. 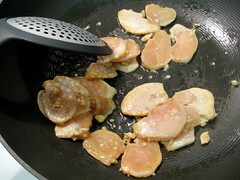 Put the chicken into the wok, stir frequently until all of the pink is gone and the chicken has turned a whitish color, and remove to a bowl. This should take approximately two minutes. 8. 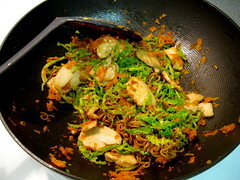 In the same wok, put in the remaining canola oil. Heat thoroughly. 9. 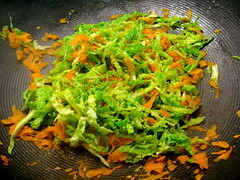 Add the cabbage and the carrot to the pan, as well as the remaining soy sauce. 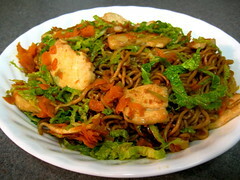 Make sure to add the vegetables before the soy sauce, or the soy sauce will splatter in the hot oil. 10. Stir occasionally until the vegetables become slightly tender. This should take approximately two to three minutes. 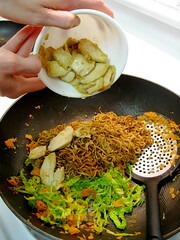 If the vegetables start to stick or are getting browned, add a little bit of water to the pan. 11. 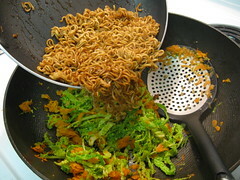 As you are cooking the vegetables, simultaneously cook the ramen noodles in a separate pan, according to directions. 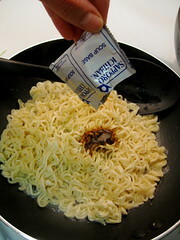 If there is liquid left, drain the noodles so that they are completely dry, and then add the seasoning packet that came with the noodles. 12. 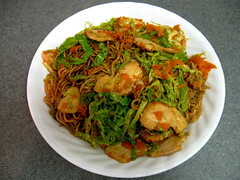 Once the vegetables and noodles are cooked, add the noodles and chicken to the wok with the vegetables, and gently stir until well-combined. 13. Serve in a shallow bowl immediately! Great article you got here. It would be great to read something more concerning that theme. Thank you for sharing this material. Being in university myself i know how hard it is to eat healthy, you just reheat store bought food but this recipe is going to be my saving grace! Thank you so much for sharing it!